It is estimated parrots spend 50-70% of their day in the wild foraging for food. This involves searching for available sources, choosing the most desirable items, and then manipulating the chosen food with their feet and beaks. How does your parrot spend the day? To get your bird started foraging, try using skewers or placing bowls in different locations. Cover bowls with butcher paper, put treats in paper bags, or hide that special nut in a puzzle toy. * Whistle or wave on cue. * Eat with a spoon, drink from a cup, or other fun behaviors that also help come medicine time. * Flap, turn somersaults, dance or jump for much needed, good exercise. 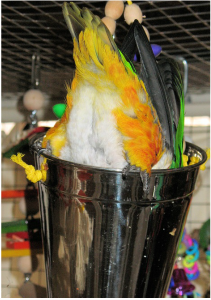 * Play peek-a-boo behind a towel to make the towel less threatening to your bird; or playing “where’s parrot?” with a small mirror. * Sing to them, especially songs with their names; imitate each other, copy what your bird says. * Whisper things like “parrot” which helps reduce screaming too. * Play a catch game. Many birds will throw objects back to you with little training. * Spend mealtimes together. For birds in the wild, this is their most social time. * Train husbandry behaviors like going into a carrier, filing nails or going onto a scale. * Go for a walk in the neighborhood in a safe travel carrier, or for a fun ride in the car. * Visit a friend and take your parrot along for the outing and some social interaction. Fresh air and sunshine is good for all of us. 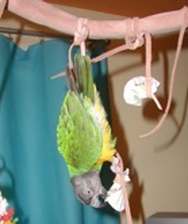 To learn more about how to provide your parrot with plants and branches, here are a couple of helpful documents.